It’s time to make working together what it should be—intuitive. 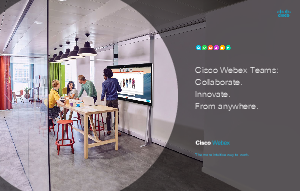 Cisco Webex Teams enables teams to meet, create and communicate continuously on a single easy-to-use platform. Innovation and work keep moving forward, even after a meeting ends. And everyone enjoys an exceptional experience safeguarded by enterprise-grade security no matter how big the business scales.